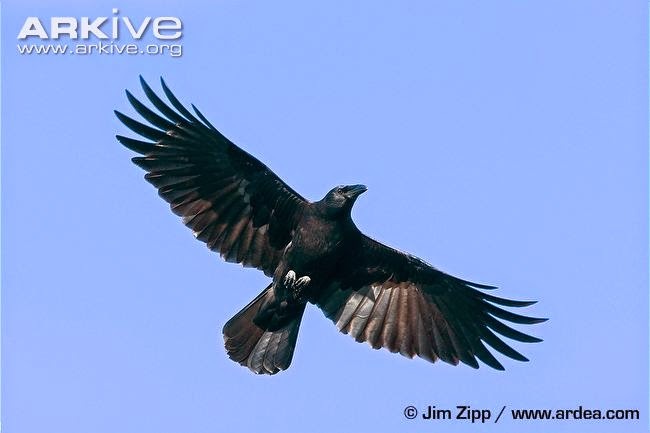 The images above show the size variability and the overlapping body size of American Crow and Chihuahuan Raven. Field identification can be extremely difficult when these birds are on the ground or perched on limbs or telephone poles. The best identification field marks occur when the bird is in flight. The wing length is significantly longer relative to the body on the Chihuahuan Raven, and the tail is shaped differently than an American Crow. The tail of the Chihuanhuan Raven is not as wedge-shaped as the Common Raven which does not occur in North-central Texas (see field guides). If one is lucky, a bird in the wind might expose some white at the base of the neck feathers, but this field mark is not always visible. A little of this can be seen on the middle image above. Status and Distribution for North-central Texas - Chihuahuan Ravens only occur in the western half of North-central Texas in the breeding season where they overlap with American Crows which are permanent residents. However, Pulich suggests that most Chihuahuan Raven observations are historically from Baylor, Throckmorton, Wichita, and Wilbarger counties. Winter records of CHRAs in the North-central Texas region are still considered rare (and suspect), and Pulich suggests that the status of this bird in winter is still not fully understood.